A squirrel feeder can bring just as much enjoyment as a bird feeder, especially if you can keep the squirrels away from your bird feeders. One way to do that is to provide a feeder just for them. If you do not want to go to war with the squirrels and enjoy watching them in your yards, then invite the little furry and entertaining friends to dine at their own feeding station. As they say, if you can't beat them, then you might as well feed them. It will be a lot less frustrating and take less energy on your part to put out a squirrel feeder than to constantly be on the front lines in a battle with them. 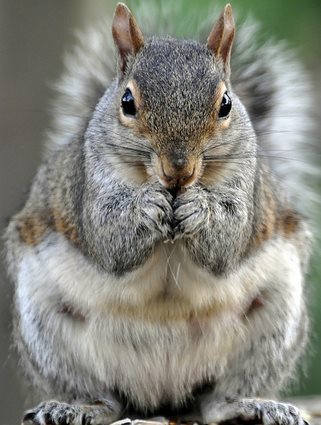 It is possible to feed squirrels and birds simultaneously and enjoy doing both. The Heritage Farms Squirrel Feeder was especially liked by users because it is easy to refill via the removable lid, keeps out the rain and snow and, because it is made out of metal, the squirrels do not chew on it. You can fill it with whatever you like. Some people have filled it with whole, unsalted peanuts and a mix of fruit, seed and dried corn kernels. People also liked the Heath Squirrel Feeder which you can mount on a pole or tree, is made from western red cedar which won't rot and will keep the squirrels from bird feeders, if that is an issue. And if you love squirrels, you'll love this book we found, Squirrels: The Animal Answer Guide. As one reader commented, "If you have been observing the squirrels in your backyard or garden, and have been wondering just what they are "thinking" or what they are "up to," this is the book for you. Very well written, and particularly well organized, it is a book that you go back to again and again, right after observing your furry friends. You will enjoy it!." 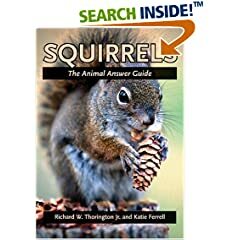 It is a fun reference book that has a lot of detailed biological and behavioral information about squirrels, yet not so technical that it is easy to read for both young and old squirrel lovers alike. 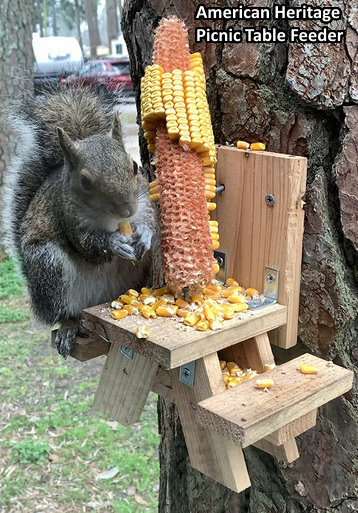 If you want to build your own squirrel feeder than you may want to visit our free squirrel feeder plans page that has plans for three different types of designs for feeding squirrels, including one for a squirrel corn feeder. For more information about these fascinating little mammals, here is a page about squirrels on Wikipedia. So instead of trying to get rid of squirrels, now you can encourage them to visit and enjoy.